The Novus Heavy Duty B56 has a stapling capacity of 210 sheets and features a sliding adjustable depth guide allows you to set the staple location and ensure you clinch your desired depth on each and every document. 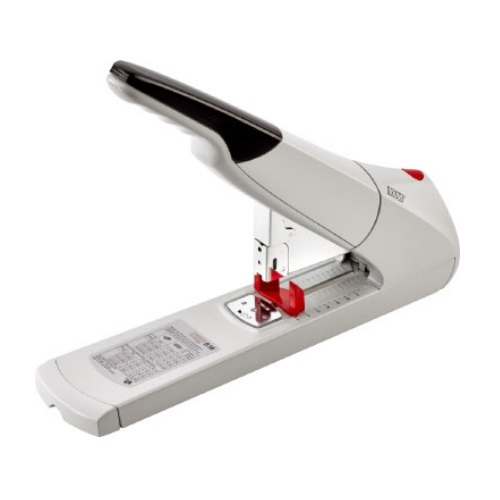 The B56 also features an innovative Anti-Blocking System (ABS) which prevents the possibility of a staple jam and having your documents stuck to the stapler. A dual staple guide system further ensures trouble free performance by providing even pressure on the staple legs until it clinches your documents. The Novus B56 is firmly planted on its 14 1/4" base. The rubber base provides safe, slip free stability to ensure your Heavy Duty stapler will not budge while stapling through over 200 sheets of paper. For optimal performance, we recommend using Novus Heavy Duty #23 staples. These thicker gauge, precision formed staples will ensure your Pro Stapler performs as designed. The B56 will accommodate staples up to 24mm in length.